Editors Note: I wanted to stay away from this impression as I had some help with the development process of these tires. Michelin sent Joe a set of Starcross 5 Soft tires for our 2019 Suzuki RM-Z450 and this is what he had to say after several hours on a set. I thought it would be cool to hear Joe’s thoughts since he used to race with Michelins back in the day (when they were involved with AMA Pro Racing). I tested these tires on three different tracks with varying soil types and track designs to come up with a wide range of conditions. Sunrise MX park in Adleanto CA offers a track design on relatively flat ground with differing soil types ranging from hard pack to sandy loam. Milestone is flat as well with a bit tighter layout filled with fun jumps and soil types from hard pack to sticky rutted clay. LACR utilizes a sand quarry and has a layout with good elevation changes, high speeds and a soil type of hard base with loose sandy soil on top. So three different tracks with a broad spectrum of layouts and soils and the Starcross 5 performance was excellent on this wide variety. I also stuck with a tire pressure of 13.5 in both front/rear tires. The front is now my favorite front tire, the stability on hard braking coupled with the grip and plush feel on initial turn in as well as the continued grip throughout flat or rutted corners is superb. The Starcross has decent durability (slightly better than a MX3S), great bump absorption, and consistent grip even with a little wear are just a few highlights of this excellent tire. I am a front end steering rider so these fit my riding style well for the conditions that I ride. I ran Michelin tires when I was racing professionally and when I look back at the tire I raced on back then, these Starcross tires are much better on initial lean and carcass feel. The rear Starcross 5 is an excellent tire as well as offering great straight line traction along with excellent bump absorption and unbelievable side knob traction (when leaning into a rut or pushing those side knobs into a hard pack flat corner). Once the tire got a little wear the side knob traction was still pretty dang good, however the straight line traction decreased a little, but the bump absorption was still great. The tough choice for a tire manufacturer is finding the balance between traction, performance and durability. The ability to produce a tire that has great grip is there, just ask anyone who has been fortunate enough to ride a spec tire (like I did), but they only lasted literally one race. Michelin has done an excellent job of providing a lightweight, durable tire with excellent grip. This rear tire is so sticky on lean that it sometimes is tough to swing the rear end around on bowl type corners. It took me sometime to get used to that, but once I figured it out my confidence went up. The rear tire side knobs will chunk if you ride hardpack too much so be forewarned. 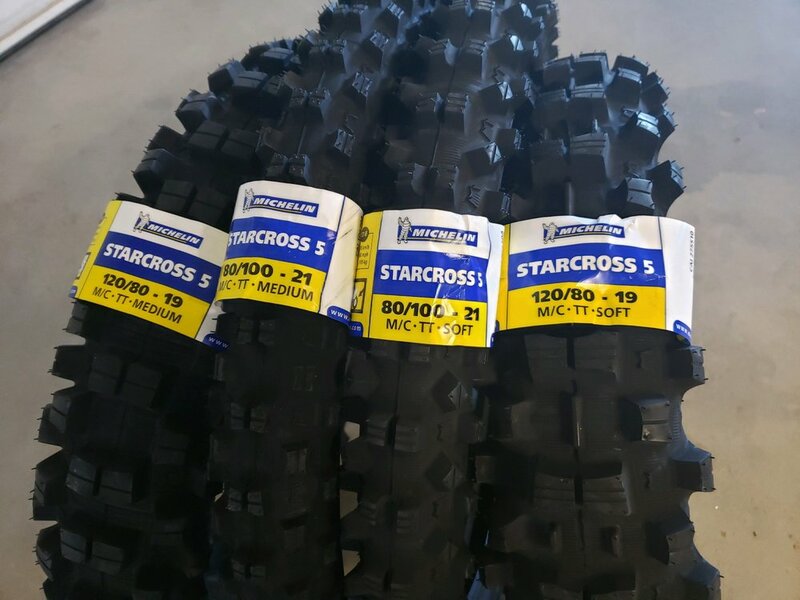 Michelin makes a Starcross medium if you’re in need for some hard base dirt type of riding. Well done fellas, stay tuned in upcoming weeks for an impression of the Michelin Starcross 5 medium compound as we get into warmer weather out here in California which means harder track surfaces. Yippee! UGH!